This painting is one of the highlights from a group of works painted by Irma Stern in Zanzibar in 1939 where she spent four months. It ranks equally with two major Sterns recently sold at auction, Arab Priest, which achieved R33 411 915 and Bahora Girl, which sold for R26 062 159. 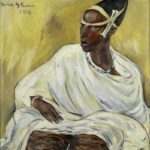 It is certainly one of, if not themost important painting to be offered at auction in South Africa over the past decade and will no doubt create a great deal of excitement amongst collectors. […] Having been held in select private collections, the painting has a good provenance and has not been seen publically since it was included in the exhibition Homage to Irma Stern, presented by the Rembrandt van Rijn Art Foundation for the Cape Arts Festival in 1968 at the Rembrandt Art Centre in Johannesburg, the Pretoria Art Museum and the South African National Gallery.